It is sometimes more economical to train your site staff to install your own instruments rather than contract HMA Geotechnical to make numerous visits to your remote site. This is where our training service comes in. We come to site with your staff and equipment and train your people to carry out the simpler time consuming components of the installation program. We will spend as much time on-site to ensure your staff are confident and capable to carry out these works. We will always be available to return to assist, program or commission a project as you or the client requests. Our Technical Services Group offer clients the option of installing their equipment themselves or have our team of experienced engineers and technicians carry out the works and commission it to their satisfaction. Remember our warranty extends to our installation services, so if the equipment does not function as designed we will replace it, if it is deemed to be an instrument failure or an installation error. HMA Geotechnical offer a customised design service to enable either an existing product to be remodified or to design and construct a one off product to meet our client’s requirements. This can be a single item or a manufacturing run of hundreds. With our long history of design and extensive field experience, we have probably seen a situation similar to yours previously. If you do not see what you want in our standard product listing, ask about a customised design to suit your exact requirements. HMA Geotechnical offer a comprehensive repair and maintenance service for our own manufactured products and also those of our global partners, where warranty allows. To use this service, you must fill in the repair questionnaire and send it back with the product and include as much information as you can about the problem. You will then be forwarded a quotation for the repair which will be carried out on receipt of an official purchase order to carry out the repair. Repair time will vary depending on complexity. For repairs and service please contact us. 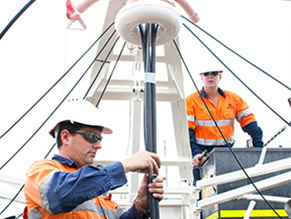 HMA Geotechnical offers full aftermarket care of its products and our facility in Melbourne can calibrate many of our popular products, meaning less downtime and more cost effect use of your equipment. Next time you have a short time usage requirement for any of these items, give us a call and let us help you.